Have recently bought me an SX 12 and today when I reset it, it is not possible to proceed in the menus. It is not possible to proceed in the menu and nothing moves in the display when I touch the levers in the calibration menu. Also stands Missing model in the display. The radio is now completely useless and I have pressure and moved on all buttons but nothing happens. Habe mir vor kurzem eine SX 12 gekauft und heute, wenn ich sie zurücksetze, ist es nicht möglich, in den Menüs fortzufahren. Es ist nicht möglich, im Menü fortzufahren, und nichts bewegt sich in der Anzeige, wenn ich die Hebel im Kalibrierungsmenü berühre. Fehlendes Modell steht auch im Display. Das Radio ist jetzt völlig unbrauchbar und ich habe alle Tasten gedrückt, aber nichts passiert. first of all you have to create a Model! Then the Transmitter will work. Use the Preinstallation "Easy" for the 1. Modell in the Memory. Without a Model the Transmitter will not work! I cant create a model since i cant acces the menus. Can i create a model if i take out the memory card? No. card may not been taken out. You have to perform the calibration with the rollers on the backside. I have done the calibration with the sticks and the rollers on the back. The red light around the power button does not turn on when i move the rollers. The "OK" button does not become blue. Had you moved the rolllers and sticks in middle position before you turned on the transmitter? If not do so, then perform the calibration. Every control unit, rollers too has to be about 10 seconds in its upper and lower end position. You need to push and hold the gimbals moderately in the upper left and lower right corners. Bye the way, why did you a factory reset! I have done all the steps you mention, but the "OK" never turns blue so i cant go further in the menu. I bought the radio second hand and i didnt want the previous owners settings, therefore i did a Factory reset. And why is there a option of a factory reset if i cant use it? 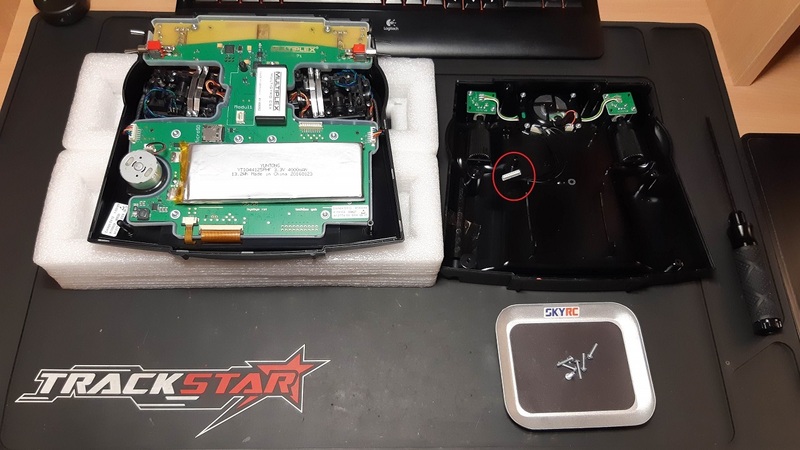 You can check if the cable of the back cover was forgetten to connect , if yes the led will not flash when you are moving the rollers in calibration mode. Thanks for fast support Andreas, i also Think there is a problem with the rollers on the back. They are not giving a signal to the radio, maybe the previous owner had disconnected them (really strange) gonna Open the radio as soon as i get Home. The Radio works now cant believe that the CABLE was not connected, thats why the USB and speaker and Rollers were inactive. And now the big questiion is was it the FACTORY or the Previous OWNER hos forget to connect.